I can think of no better way to ease back into reality from a long holiday weekend than with a finished quilt post. Here is the Positivity quilt, which you may have seen snippets of before, here or on Instagram (which has replaced Twitter as my favorite social media app because of all the awesome quilt people). 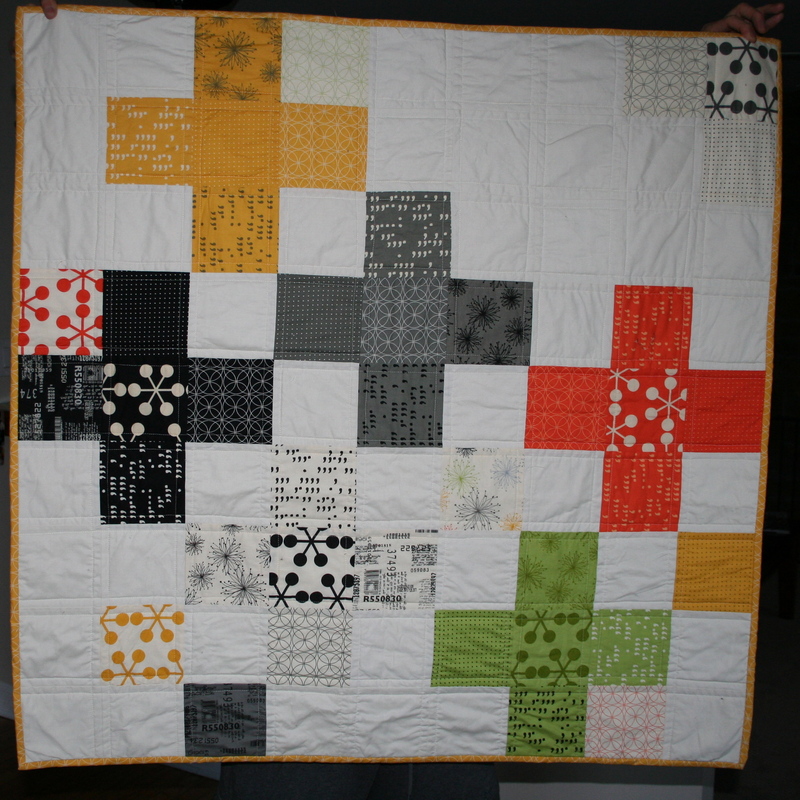 It’s a sample of the kind of quilt that we make in the Beginning Quilting class that I teach at Rock Paper Scissors. 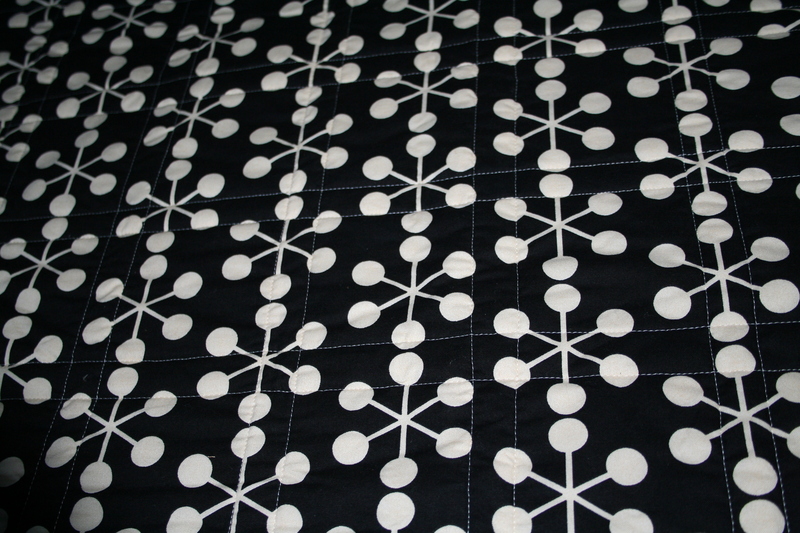 It’s 39″ square finished and features the Comma line of fabric along with 3/4 yard of Kona Bone. In my class, the students choose a charm pack and a coordinating fabric for rotary cutter practice. They get to choose the design themselves, which is one of my favorite parts, and the Comma pack, with at least five squares per saturated color, demanded pluses. It’s the perfect learning quilt because it has just enough difficulty to be challenging (matching seams in patchwork, grid quilting, hand-made binding) but it’s got enough fun features to make the process quicker (pre-cuts, manageable size). 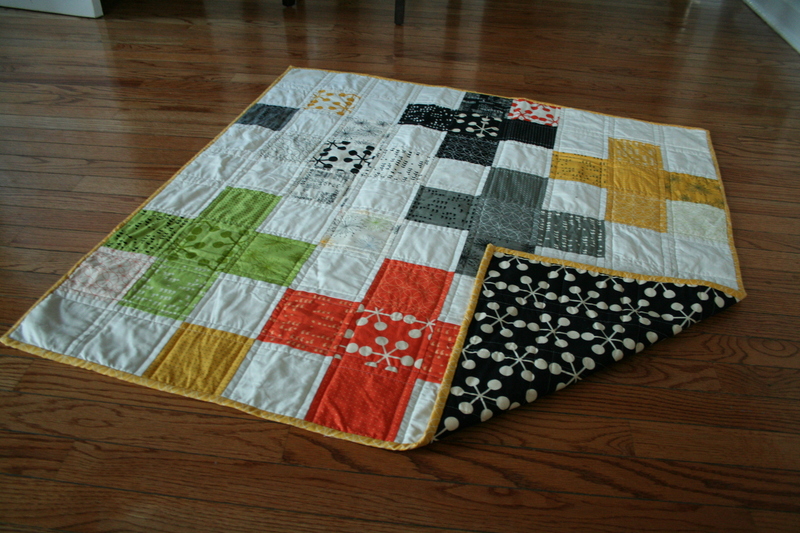 It’s a great size for a Learning quilt, and it’s also a good size for a baby gift. This particular quilt is also a lesson in fabric value. There are high and low volume prints, and some that change depending on their location. 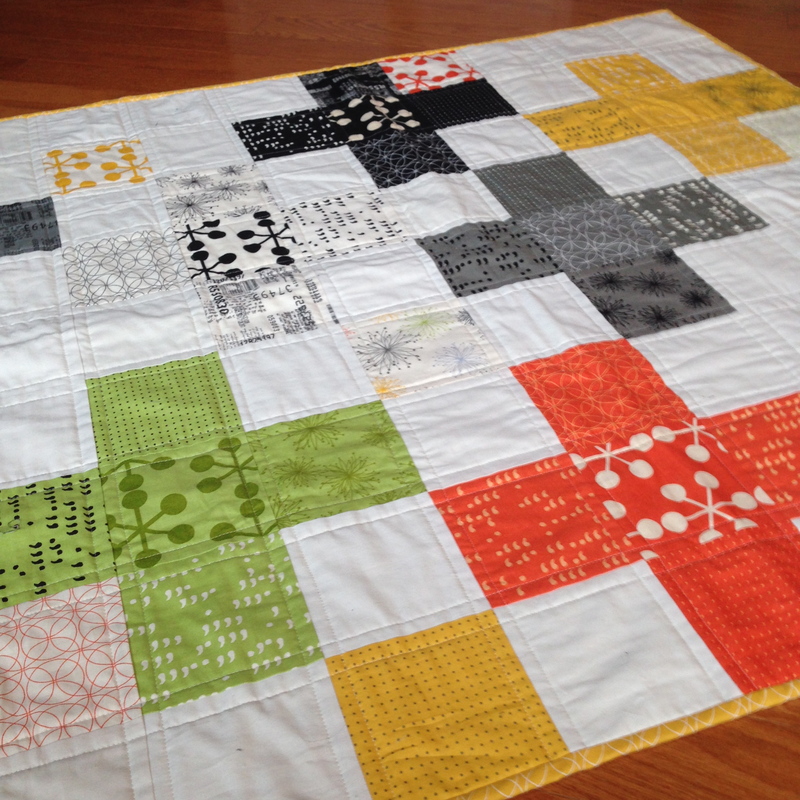 We can also talk about print scale and how to choose fabric for a project. I like to use big prints on the back. I quilted it in a grid about 3/8″ on either sides of the seams and hand-sewed the binding to the back. I love the back as a whole-cloth quilt of its own. A great print will do that. I had wanted to make a plus-sign quilt for a little while, and this was the perfect time to do it. 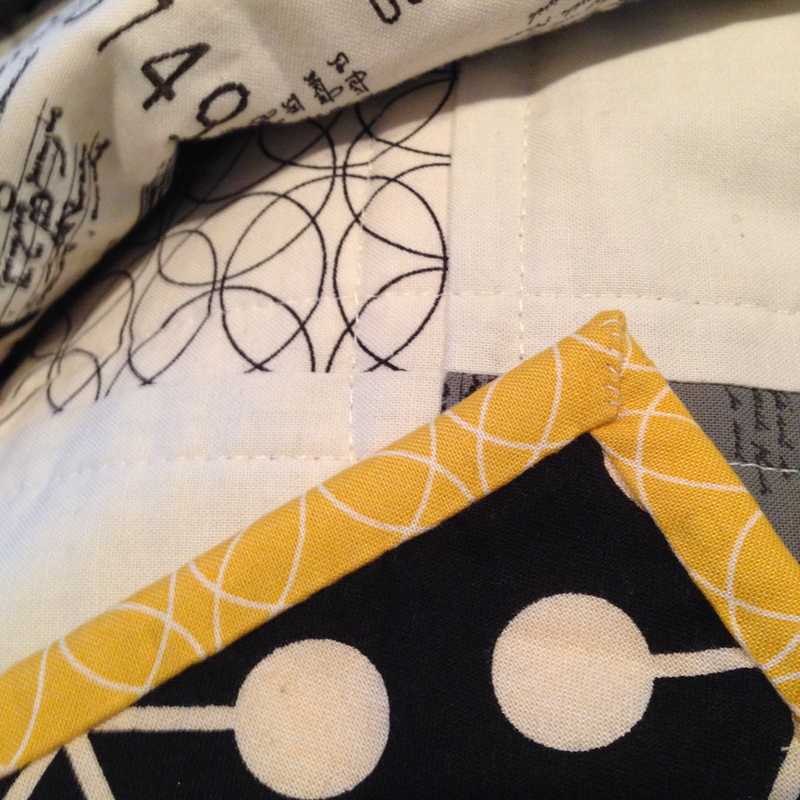 Positivity is key in all parts of the quilting process, and learning tends to have its share of ups and downs. 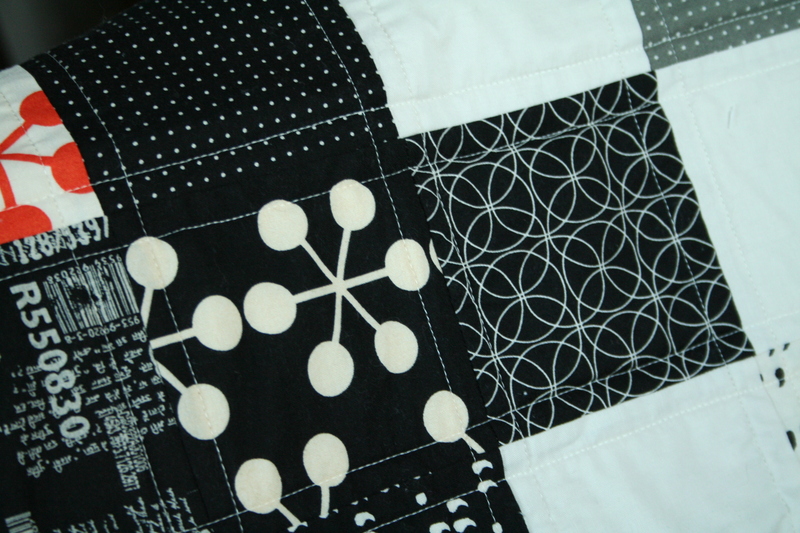 Of course I’ll let you know when a new session of Beginning Quilting starts up in the new year. Until then, think positive.